subtitle: "How to Write Accurately about Psychological Disorders, Clinical Treatment and Human Behavior". Writers frequently write about mental illness and psychological motivations, but all too often they use terms and concepts that are clichéd, outmoded or just plain wrong. Written by a clinical psychologist who is also a professional writer and writing coach, The Writer’s Guide to Psychology is an authoritative, accessible, fun, and easy-to-use reference to psychological disorders, diagnosis, treatments, psychotherapists’ work and what really makes psychopathic villains tick. The only reference book on clinical and counseling psychology designed specifically for the needs of writers, The Writer’s Guide to Psychology presents specific writing dos and don’ts to avoid the psychobabble clichés and misunderstandings frequently seen in popular writing. The book’s extensive sidebars include Q&As from real writers, information on controversial treatments and issues, tips for using realistic psychology to create complex and compelling characters, and Don’t Let This Happen to You! boxes that humorously expose mortifying mistakes in fiction, film and TV … and teach readers how to get it right in their own writing. Written in an approachable, easy-to-understand style that’s perfect for both in-depth study and quick answers to specific questions, The Writer’s Guide to Psychology is a unique combination of accurate psychology, myth-busting information and practical guidance that belongs on every writer’s reference shelf. 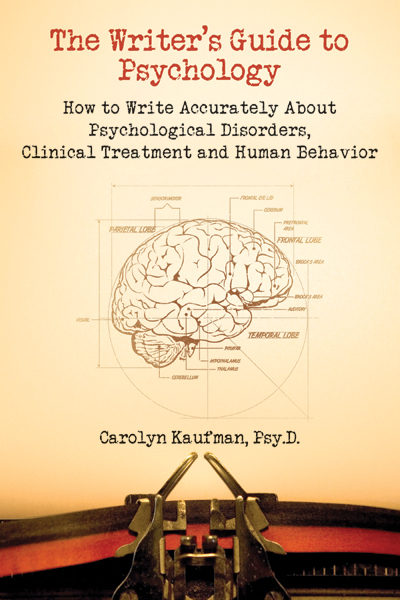 About the Author: Carolyn Kaufman, Psy.D., is a clinical psychologist, a professor of psychology, a writing coach, and an author. Regularly quoted by journalists as an expert psychological source, Kaufman has written articles for The Writer, Woman’s World, Fiction Factor and FreelanceWriting.com, and writes the “Psychology for Writers” blog for PsychologyToday.com. Kaufman is an assistant professor at Columbus State Community College in Ohio. WRITERS GUIDE TO PSYCHOLOGY MEDIA KIT available here in PDF.